As a regionally-based business, we have welcomed the increased media interest in the ongoing drought conditions in Eastern Australia. We have also been watching the weather closely, hoping for the dry and hot conditions to ease, and trying to anticipate the impact on our business and customers. You have likely seen stories of drought and wondered about the impact on wheat production and cost of flour. The majority of Australia has experienced next to no rainfall between April and August this year. In most cases, not even registering 20% of their usual average rainfall. 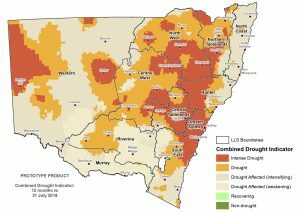 100% of NSW and nearly 55% of Queensland is drought effected. Wheat and associated winter grains should have been planted months ago. Much reduced areas were eventually planted, but have struggled to survive. 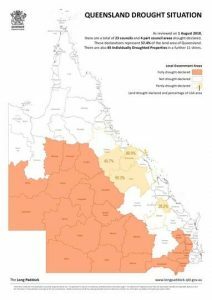 Even though NSW & Southern QLD have received some rain recently, it was too late for the majority of wheat crops already in the ground. Poor conditions are set to continue through summer cropping rotations. The social and emotional impact of drought has been well reported, but the actual impact on wheat production and pricing is harder to unearth. While we will get a clearer picture of reality through Spring, it is clear that the price of wheat will continue to rise. Speakers at August’s Australian Grains Industry Conference shared mixed outlooks for national grain production. While the Western Australian harvest looks strong, drought conditions in NSW are extending further into Victoria, Queensland and South Australia. The 2017/18 harvest was the lowest in eight years, and Australia’s wheat crop is poised to record a second consecutive season of below average production. While some of the pain will be offset by a strong season in Western Australia (with ABARES reporting that their harvest will increase by 2.5 % from last year) demand is high. Grain is currently being shipped into drought-affected areas from WA and SA to meet increasing stockfeed demands. This will continue through 2019. And it’s not just Australia seeing reduced supplies. USDA’s August report has predicted a 6.63 million tonne drop in wheat production globally. This is without adjustment for the Australian market, which will likely be reflected in their forecasts as we head into spring. While we cannot predict the exact impacts on price, it is no secret that the base cost of wheat is increasing. The ASX Eastern Australian Wheat Futures index is climbing toward $400/tonne, the highest price in a decade and well above last years pricing. As a result of this, the cost of flour will increase significantly. With national media attention being drawn to the drought, now is the time to start speaking with your customers about the potential impact across the supply chain. We’re committed to being open with you over this time and will keep you updated as we all gain more clarity on the outcomes of the 2018 harvest.